Wonderfully inventive, charming and witty animation destined to be a classic. 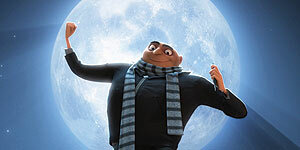 Steve Carell provides a likeable voice to Gru combine that with wise-cracking humour and we get both one of the best movies of the year and a stylish animated superhero phenomenon. A real delight. Best animation since The Incredibles. i have to agree with the other users. i took 2 of my kids along an we loved it. ok so its not quite as funny as the trailers made it out to be but still well worth a trip to the cinema. I agree with jonox, I am not sure if the reviewer saw the same film. It is a matter of taste I gather. The first half was a bit slow, but the second half was a riot. Gags after gags piled in. I had lots of laugh. The majority of the audience did. Always a proof of an entertaining film. Perhaps our taste is not up to Mr Turner's (the critic) standard. excellent film, unsure what the reviewer was watching, but me, wife and no fewer than 3 children absolutely loved it. ignore the Grinch's review and go see it.